There is no shortage of funny cat videos on the Internet and some of the best involve cats misjudging where and how far they can leap. Many cats can jump to great heights and many cats can also jump to great lengths. The kitty depicted in this video can apparently do neither. Baby kittens learn a lot about the world from their mother. Mom is a great source of comfort and nutrition too, but in this case her jump fail was a these kittens' source of terror. Cats have this incredible habit of getting themselves into the most precarious of situations. This kitty finds itself stuck on top of a dining chair without a safe exit strategy. In most cases, the cat is attempting to jump forward and falls. 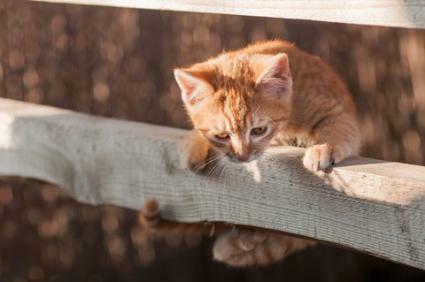 This kitten has that intention in mind too, but things don't always go as planned. It's perfectly understandable if a cat can't bound across a vast distance. It's less understandable when the cat fails to jump somewhere it's already touching. Bringing your cat to work can certainly inject a new energy into the office. Dare to achieve the impossible, like Neva, and you just might make it. Or not. Mirror, mirror, on the wall. Who is this other incredibly cute kitty cat staring back at me through this window into what must be another room in the house? After losing his footing just walking around on the icy car, Waffles should have known that jumping was a terrible idea. Even so, his owner says that Waffles the Terrible "fails a lot... every day at one thing or another." Kitties can be a wonderful source of entertainment and companionship for all sorts of different people, particularly when they fail spectacularly at what they think they can do. Just follow some basic safety tips to make sure the cat in your life survives these inane stunts.